Bruno, Piero, Roberto, Silvana collaborate with a rich network of friends and associations concerned with social projects in various European countries. During the many years spent abroad we became deeply involved in the themes of multiculturalism, Europe and peace. Our work resulted in the creation of several social and cultural initiatives, such as “Insertion”, a Belgian non-profit organisation that operates in Brussels since 1992 for the social integration and active citizenship of marginalized groups, mainly unemployed youths and migrants. After the establishment in 2001 of the European Centre of Gargnano, our activities become focused on supporting the growth of Europe and taking up some of her challenges: the European citizenship as built from various values and forms of democratic participation, the multicultural society (from the European motto “United in diversity”), the dialogue among religions, and the nonviolent solution of conflicts of interest (positive peace). After a long involvement with social and cultural issues, we intend now to integrate the same commitment with a spiritual dimension, thus intersecting the horizontal axis with the vertical axis. After studying theology in Rome and literature and philosophy in Milan, I taught for six years in the Lombardy region, when I contributed to the establishment of “Telefono amico”, an emergency service for troubled children and to the association “Mondo X”, a grassroots support for immigrants. After completing my education as a sociologist at Leuven (Belgium) – with spells of teaching assignments in Somalia for a total of nine months – I moved to Brussels where I taught at the European School. At the same time I became involved in many social and cultural activities with the Italian and Spanish communities and established an innovative three-year educational program called “Workers’ University”. As the Director of CBAI (Brussels Centre for Intercultural Action), since 1980 I devoted myself to the social problems deriving from the complex human geography of Brussels, a city that has become irreversibly intercultural too quickly. For a long time I have coordinated several European projects within the programs Horizon and Integra, which were designed for the harmonious integration of migrants in Europe. I joined many workshops on interculturalism organised by the European Council in Strasbourg. The above contributions were recognised with the honour of Cavaliere della Repubblica conferred upon me by President Ciampi in 2000 and of Chevalier de l’Ordre de Leopold by King Albert II of Belgium in 2001. I am now trying to develop this multifunctional Centre, which was jointly embraced to promote the cross-fertilisation of projects formulated in Italy and other countries within a European view, which is conceived for the people by all those who believe in this great dream. We are convinced that this new geopolitical entity will be able to prevent that the inevitable globalisation of ideas, behaviour and economy becomes a means of further marginalizing entire continents. We wish to see a Europe that is able to put forward strong and coherent values in order to globalise solidarity as well in our new motherland-earth. 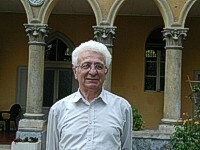 Born 1941 in Bologna, Piero gained two high school diplomas (commerce and scientific lyceum), earned a Hons Degree in Biological Sciences from the University of Bologna (1965), did not try to avoid military service (artillery officer) and did research and taught from 1967 to 2003 at two universities in Italy (Bologna and Parma), one in England (Newcastle upon Tyne), two in Switzerland (Geneva and Lausanne), and one in Australia (University of Queensland, Brisbane). After an initial involvement in experimental embryology, Piero dived into the world of molecular biology and the medical sciences. After a PhD in neurology while at the Medical Research Council (UK), he has always been interested in the development of the brain and the origins of behaviour. This has brought him to topics relating to aggression and peace studies. In 1991 Piero established with other colleagues a degree in Peace and Conflict Studies at the University of Queensland, now a major centre of peace studies in the world. He has promoted the new post-graduate studies of medicine (McGill system) and introduced in 1995 the first course of medical history in Australia. In this country dominated by migration, Piero became involved in multiculturalism by promoting the Italian culture and editing for eight years Convivio, the bilingual journal of Italian studies. In 2004 Piero has taken an anticipated retirement and went back to Italy to promote on the shores of Lake Garda peace studies, interculturalism, and a more just society. Recent texts on peace education, multiculturalism, medicine, biology, and spirituality. Born in Piedmont, I migrated to Belgium in 1968 and studied sociology at the University of Leuven, where I met Silvana and Bruno. This friendship developed into a common work commitment that started in 1970. To follow an inclination toward manual activity, I took a diploma in printing, which allowed me to be a printer for twenty years and instruct young people within the cooperative Barbiana in Brussels. In my free time I search for objects produced by human labour, which are often rich in good taste, intelligent solutions, and manual skill. These are instruments created ad hoc for various trades, such as measuring instruments, clocks, decorated tiles, laces, embroideries, printing wooden blocks, specially printed photographs, etc. At the European Centre in Gargnano I am now responsible for the maintenance of the orchard and the gardens, and I take care of supplies, reparations, and accountancy, besides maintaining those collections that provide the guests of the convent and me with cultural enrichment and the pleasure of beauty. I was 18 when in 1968 I left a small town in the Veneto region to go to Belgium to study sociology at the University of Leuven to study sociology. While living in Brussels, I earned a PhD in sociology from the University of Paris with a study of the conditions of migrants in Belgium. My involvement in both research and grassroots action and in several cultural and social projects led to the award in 1995 of ‘woman of Europe in Belgium’, the gold medal for work and progress conferred to me by the Chamber of Commerce of Treviso, and the trophy of the Summer School on Europe- Mediterranean organised by CEFIR in Dunkerque. Since 1997 I put my public life on hold to assist my mother who had become hemiplegic following a cerebral ictus. In these years I have learned that patience is not impotence, but a will of love that does not recede. At the European Centre I deal with bookings for the accommodation of guests, the organisation of joint projects with European partners, and computer networking, that is our web page and the news list “Cerere Gargnano”. More spiritual involvements consist in coordinating morning yoga, with to the method of my teacher Frans De Greef, and lecturing about the female religious movement of the Beguines, wherever one invites me. Maria, often hailed by us with “long live Maria”, is our only paid home aid, with various responsibilities for cooking and cleaning. A mother of three, Igor, Victoria and Rodica, Maria left Moldavia in 2001 to work in Italy and support the university studies of her children. Now, they all are graduated. 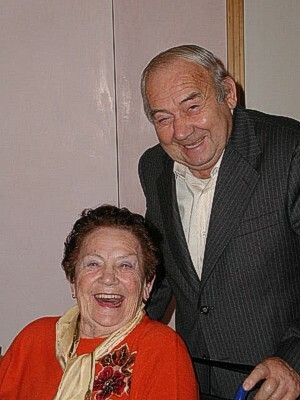 Her husband Tudor came in 2005. Loreto is the parrot of the European Centre, our mascot and effective element of socialisation for both children and grownups. 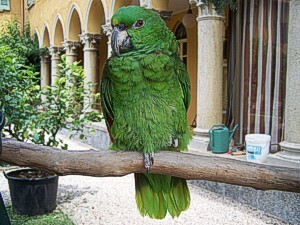 Zoologically speaking, he is a Ara parrot , but for us Loreto is definitely exceptional, always visible and audible in the cloister, perched on its stand without a retaining chain. Loreto’s distant ancestors lived in Central America, but he was born a few years ago in Italy. We have recently learned that he could be a young female, but he/she is too young to worry about these problems of identity and we accept him/her in both gender roles. Loreto says a few words in Italian and French, can whistle nicely, but he also shouts like a craw bird if he want to attract our attention. Loreto has a putative father (Gianni), solid friendships (Ligia, Anna, Larissa …) and many lady admirers, such as Susy and Heidi who bring him toys all the way. He let himself be photographed, but does not grant autographs. 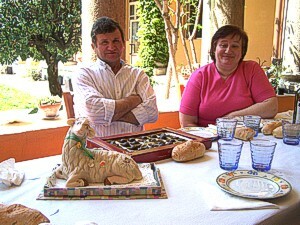 Since 2015, Loreto lives in the municipality of Toscolano, nearer his (or her) putative faher Gianni.